Divine Entities are generally thought to be messengers from a higher power who are dedicated to sharing unconditional love. They have been referred to as guardian angels, spirit guides, a celestial being, or a spiritual being. Throughout history, religions such as Judaism, Christianity, Islam and Zoroastrianism have embraced angelic beings, who are said to serve God’s will and communicate God’s word. However, there are many reported experiences of divine entity encounters (DEEs) from people who did not necessarily believe in God or consider themselves religious in any way. 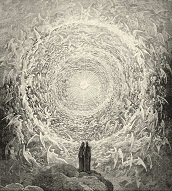 Angelic encounters are sometimes reported by people nearing death (nearing death awareness, or NDA) or who had a near-death experience (NDE), so the DEE, NDA and NDE categories of experience may overlap. According to Oxford Dictionary, the word angel is a merging of the Old English word engel and the Old French angele, both of which are Romanization of the ancient Greek word angelos (messenger, envoy, agent). Feel embraced by love, peacefulness, comfort, or protection. Perceive (either with the eyes or other senses) an entity of white or bright light. Perceive that the entity has a kind expression, loving eyes, and smile. In some cases the entity may appear in human form, but with something odd or different about them; perhaps with startling brilliant blue eyes. If in a circumstance of physical trauma or emergency, pain stops. Physical objects that appear without explanation (a cross, angel symbols) may be perceived as a message for the receiver. Healing of physical or emotional issues takes place. Shift to a new spiritual and/or universal view of the human. Feel more patient, compassionate, and understanding with others as a result of their experience. Choquette, Sonia (2007). Ask Your Guides: Connecting to Your Divine Support System. Hay House. Virtue, Doreen (2003). Messages from the Angels. Hay House. Anderson, J.W. (2004). In the arms of angels: True stories of heavenly guardians. Loyola Press. Anderson, J.W. (1993). Where Angels Walk: True Stories of Angel Visitors. Ballantine Books. Anderson. J.W. (2008). Angels and Wonders. Loyola Press. Bell, J.S. (2012). Angels, Miracles, and Heavenly Encounters: Real-Life Stories of Supernatural Events. Bethany House Publishers. Graham, B. (2011). Angels. Thomas Nelson. Kaseorg, V. (2012). God drives a tow truck: An anthology of true encounters. CreateSpace Independent Publishing Platform. Newcomb, J. (2010). I can see angels: True tales of real life angelic encounters. Hay House. Thayer, S. and L. Nathanson (1996). Interview with an Angel. Edin Books. Bauman, E. (2003). “Dreaming in crisis: Angels and the allegorical imagination in post-war America.” University of Pittsburgh. ProQuest Dissertations and Theses, 276 p.
Lange, R., & Houran, J. (1996). “Role of contextual mediation in direct versus reconstructed angelic encounters.” Perceptual and Motor Skills, 83(3), 1259-1270. William Franklin "Billy" Graham, Jr.
As the front axle of the massive logging truck fell onto the mechanic, crushing him against the concrete floor, angels appeared out of nowhere to miraculously save his life. He watched from above as God's messengers stayed on either side of his mangled body as the emergency medical team worked. Van Natta, B. (2008) Saved by angels: To share how God talks to everyday people. Destiny Image. Sarah was sitting alone waiting for a bus late at night in an unsafe part of Denver. After realizing the danger she was in, she started praying for protection. A young man with long red hair and brilliant blue eyes who was holding incense walked up and sat with her on the bench. When the bus came, she looked back and he was gone. Rob, an artist, heard “a voice” and was directed to create a series of angel paintings. One of the paintings was hung over the bed of his diabetic father. Rob credits the painting with saving his father’s life after a diabetic seizure. 5. “The Miracle on Highway 6.” A head-on vehicle crash left both cars on fire, upside down, and the occupants unable to escape. Originally broadcast with Christian Broadcast Network 700 Club. Burpo, T. & Vincent, L. (2010). Heaven is for real: A little boy's astounding story of his trip to heaven and back. Thomas Nelson.